kappa puzhukku is seasoned, spiced and mashed tapioca root. take 1 tapioca yuca kappa or 500 grams. rinse it in water first. then peel and chop the kappa. rinse again in water. place the kappa pieces in a pan. add ½ teaspoon salt or as required. add 2 cups water. cover the pan with lid and cook kappa on medium flame. in between do check. cook kappa till tender. a fork or knife should easily pierce through the cooked kappa pieces. drain all the water from the cooked kappa. mash with a potato or vegetable masher. keep mashed kappa aside. heat 1 tablespoon coconut oil in a small pan or tadka pan. add ½ teaspoon mustard seeds. let the mustard seeds crackle. then add 1 dry red chilli, 1 green chili (chopped) and 7 to 8 curry leaves. fry for a few seconds till the red chilies change color and the curry leaves become crisp. next add 2 tablespoons chopped pearl onions or shallots. you can even use regular onions. mix and begin to sauté pearl onions. sauté onions till translucent. then add 1 to 2 tablespoons grated coconut. mix well. switch off the flame and add ¼ teaspoon turmeric powder. mix again very well. pour this tempering mixture in the mashed kappa. lastly drizzle 1 tablespoon coconut oil. 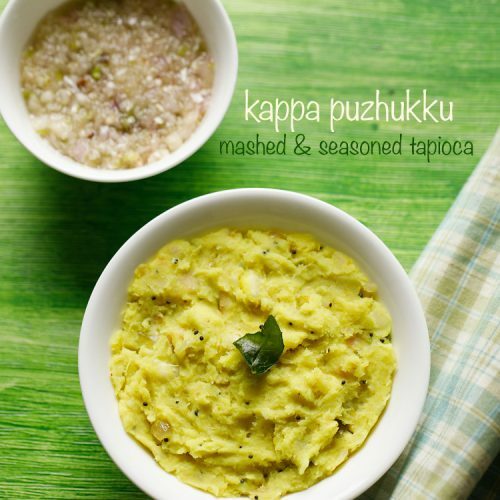 serve kappa puzhukku as a side dish with a kerala main course or with ulli chammanthi, kerala coconut chutney or red chilli chammanthi. you can even have it plain.